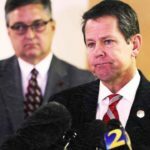 Brian Kemp is the Georgia Secretary of State and removed nearly 600,000 registered voters from the rolls this year. The cancellation of voter registration in such massive numbers raises concerns especially because the Secretary of State’s office used voters’ lack of electoral participation as justification for the move. Under the National Voter Registration Act and Help America Vote Act, using non-voting as a basis to purge registered voters from the rolls is prohibited. Georgia’s election server was also wiped clean this summer after voting rights advocates filed a lawsuit asking the state to retire voting technology. Brian Kemp is running for Governor of Georgia in 2018.